It felt like spring had come and gone within a week. It was nearly 30 degrees when we crossed the border from Serbia into Bulgaria and I was struggling in the heat. 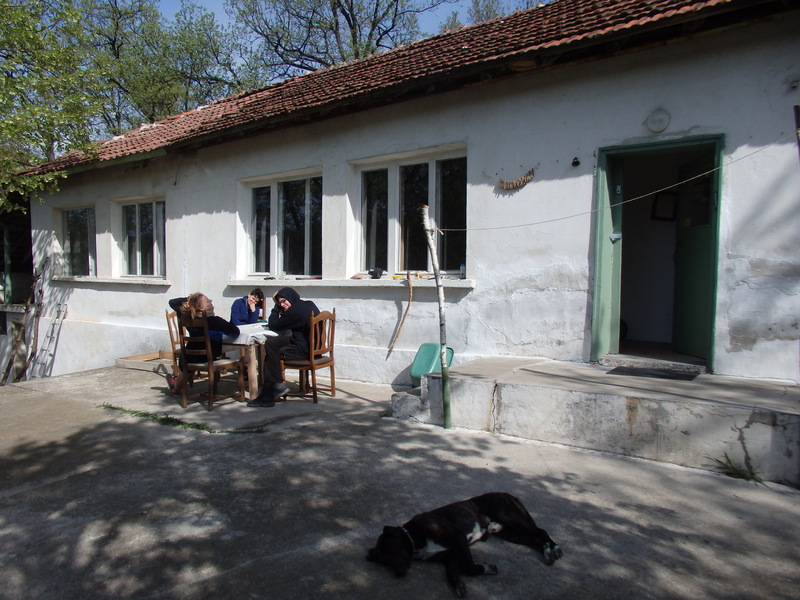 We still had ages to go until our first stop near Vidin, and light would be running out soon so celebrations for ‘100 days on the road’ and ‘reaching country no. 15’ were short lived. 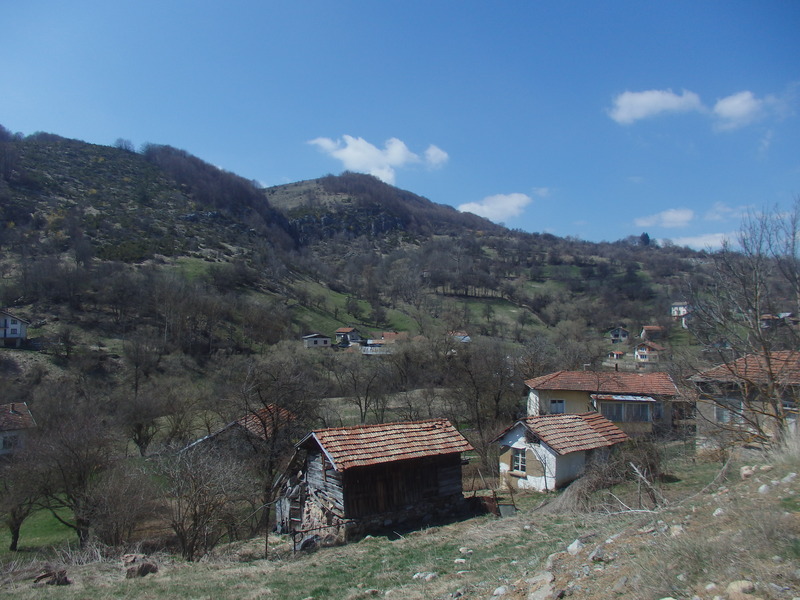 The landscape on the Bulgarian side of the border was a lot more sparse and we were welcomed with a couple of big climbs. 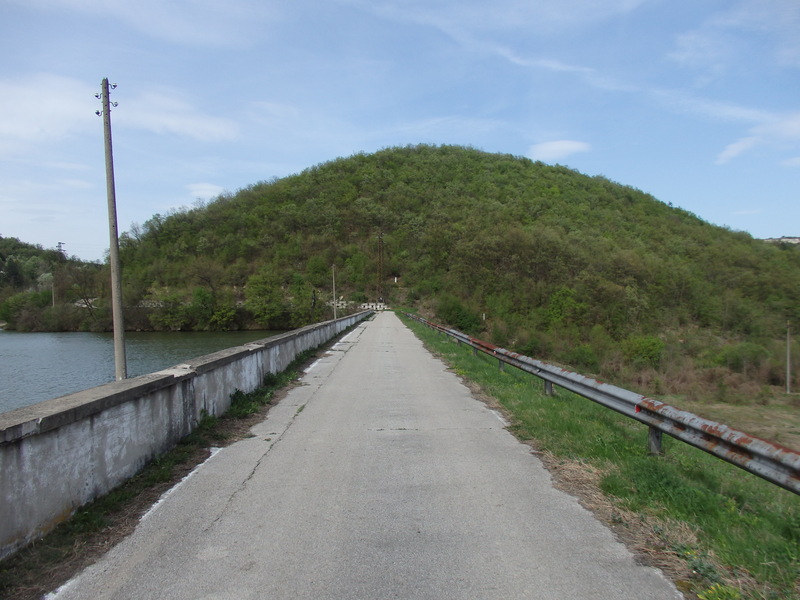 We flew downhill to Vidin (noticed my pedometer hit 50km/h for the first time) but not quite quick enough. Darkness caught up with us as we took the ring road around town to the village we were Couchsurfing in. 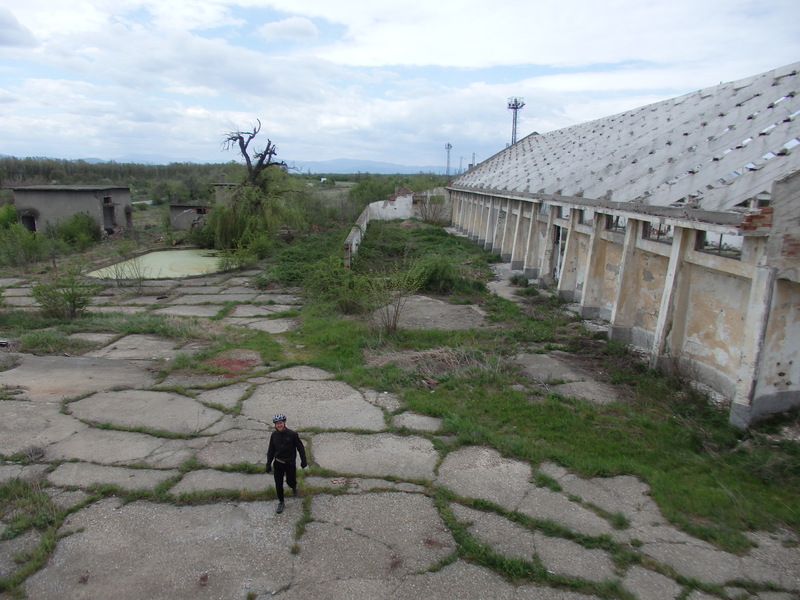 The road was horrible – clearly a key route for trucks and the surrounding buildings were huge abandoned complexes. Slightly creepy in the falling light. We were staying with a Belgian and German pair who were working on building a self-sustainable property tucked away in the middle of nowhere. As a result, it was headlights on and cycling in the pitch black along mountain forest roads until we finally found their place. I was annoyed at having been caught out by the light somewhere so remote, but grateful not to have been on my own and pleased I still had my Ikea high-vis vest with me! 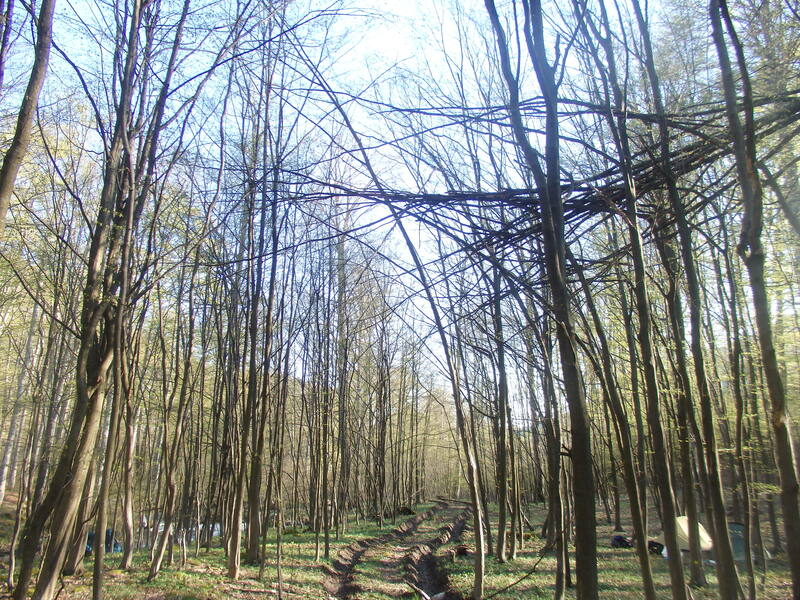 The place – Merope Centre – was really amazing. The guys there were living without electricity or any connection to a national grid and were embracing the huge task of creating an entirely self-sustainable home that they could share with visitors in the future. I left with plenty of new ideas about sustainable living to accompany me. 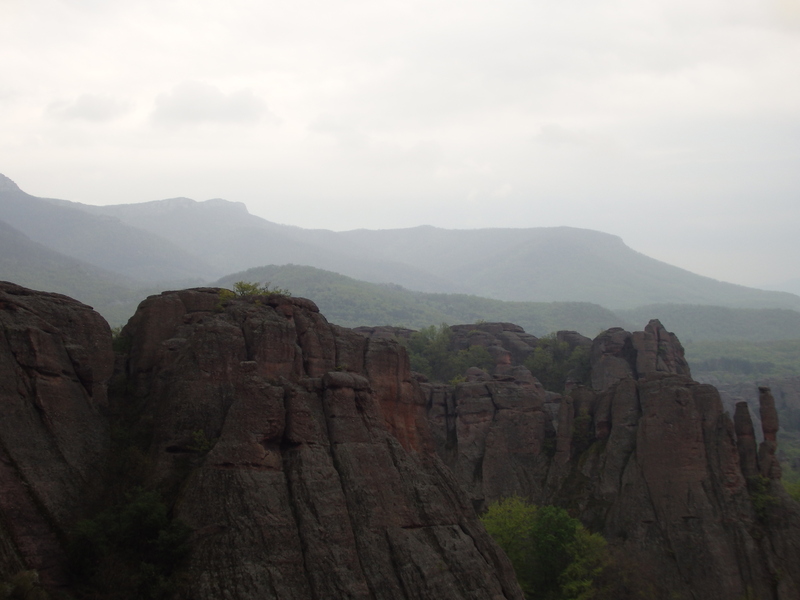 After a day off we decided to head south to Belogradcik on our host’s recommendation. It was in the right direction and looked incredible in the photos – dramatic and strange rock formations strutting the landscape. 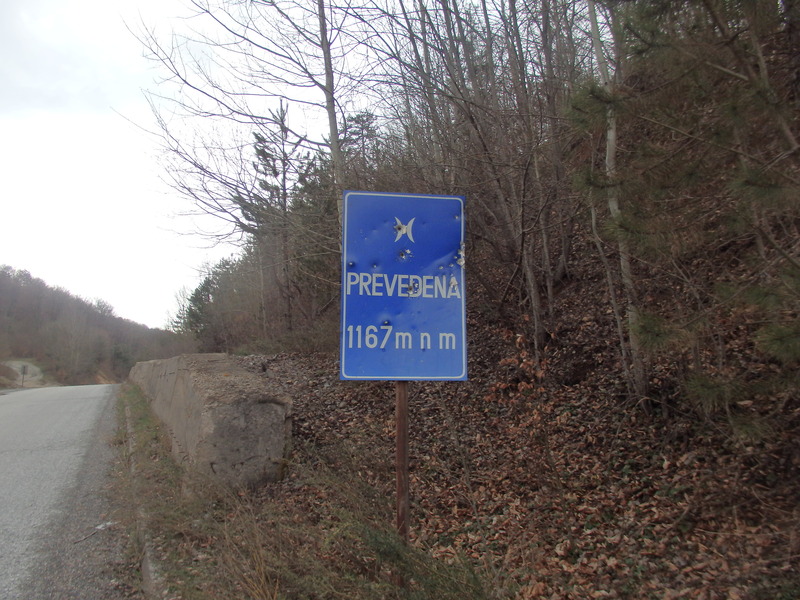 The price we paid was a tough ride – climbing over 800m in less than 50km. It started to rain when we arrived, so we decided to find somewhere to stay and explore the place properly rather than rush in the poor weather. After a some knocking around, we found someone with an available apartment – and got a gorgeous room for about £7 each. We wandered up the the top to explore the strange cliff formations. 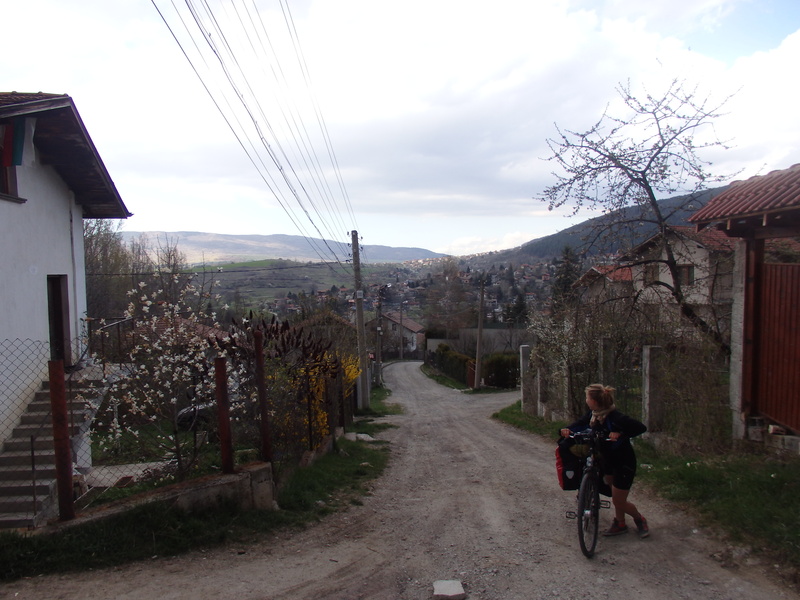 From Belogradcik we free-wheeled 10km downhill and joined a road we’d been recommended to take south. 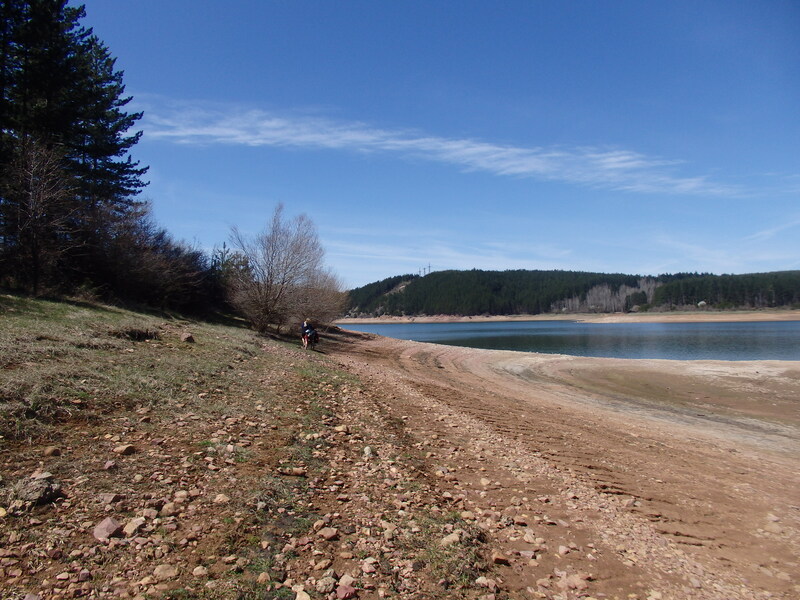 It was beautiful – remote and tranquil and for once not too much climbing. The village life feels a little more different here than in the rest of Europe. Just that tad more ‘exotic’. We cycle past shepherds watching their flock in fields under the snow capped mountains and wave at the horse-drawn carts we pass. Our first big mountain pass stood between us and Sofia, so we climbed a couple hundred metres up the hillside and found a spot to camp for the night. It was also the first wild camp at any kind of altitude and it was freezing! I was happy to have my big winter sleeping bag with me as the night temperatures still fall close to zero. The following day was seriously tough. We climbed for about 3 hours straight, zig-zagging around sharp hairpin bends. I felt my legs struggling as I crawled up, barely pushing beyond 7km/h. I’m still looking for the right mindset to embrace the mountain climbs with, but all of a sudden we were at the top surrounded by snow! 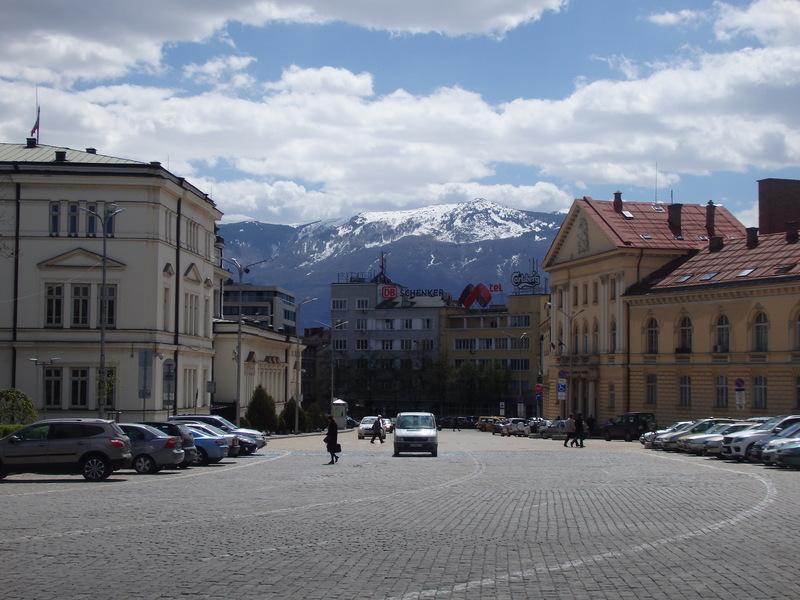 The ride down to Sofia was amazing – soaring down the mountain side and into the valley. As we arrived in town we stopped outside a random bar that had a WiFi sticker so that we could get online to check the address of where we were staying, use the loo and have a quick drink to celebrate having climbed 1,500m for the first time in a day. Inside we met a guy who was amazed at how far we’d respectively cycled. He insisted on buying us first one, and then a couple more drinks. He was a keen cyclist himself. Completely drunk, but his English was more than good enough to hold conversation with. At one point he announced that he wanted to give us a present, and he waltzed off to his apartment round the corner. A few minutes later he returned with a Bluetooth bicycle speaker to give us! He told us that he’d bought it for a bike tour he’d been planning, which he never had the chance to do. We tried to refuse, of course, telling him to keep it for when he did finally do the trip but he told us that would never happen now – his girlfriend (who was also there) was pregnant! I was touched at his gift to us strangers. 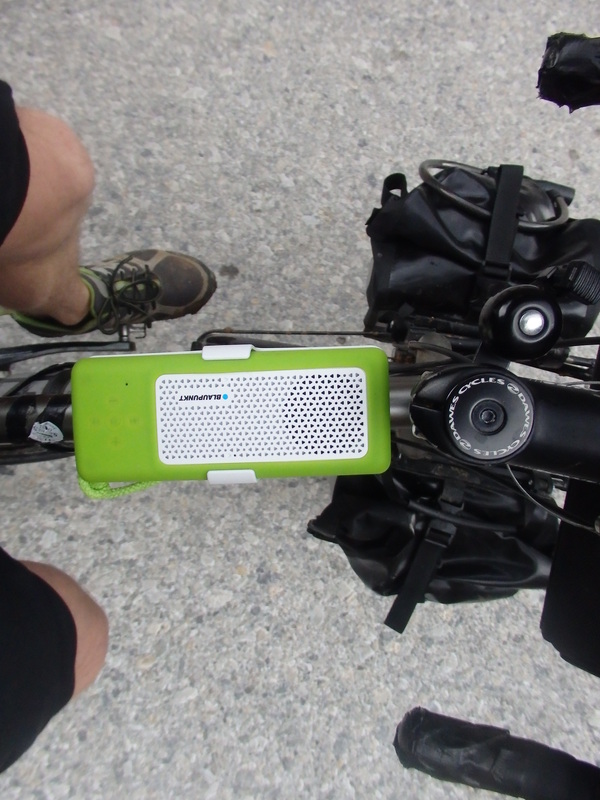 It was amazing timing – I’d been saying to Pia for the last few days that one of the things I wanted to buy in Sofia was a mini speaker to provide soundtrack for the hard roads and the camping routine. 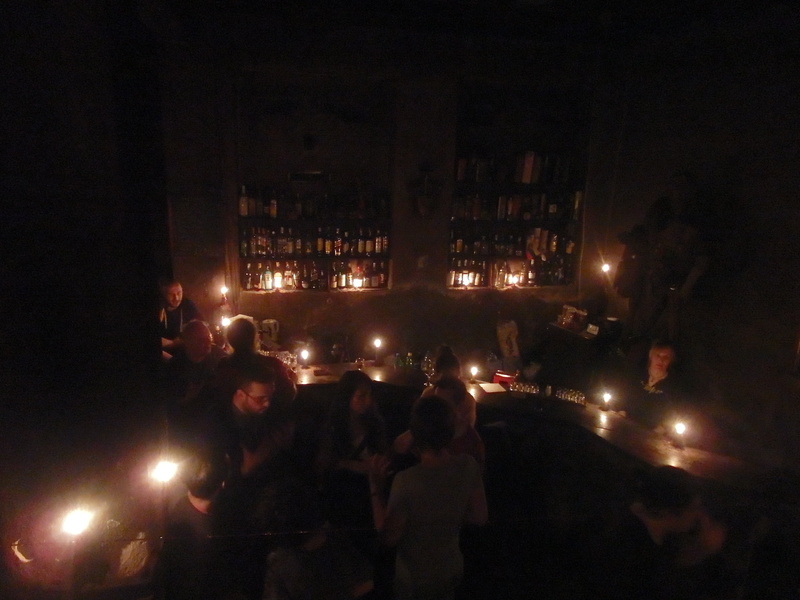 Went for dinner with our host and to a funny bar that was lit only by candle light. We left Sofia with a blaring accompaniment from our new speaker. Eventually I realised that my planned route was taking us down some fairly dubious dirt tracks and I was nervous about the route rejoining the main road. I think we’d reached a national park, and there was a guard (maybe?) in a cabin in the middle of nowhere, next to a stop sign on the road. We tried to ask him if we could pass but he spoke no English. He kept shaking his finger and telling us something about a barrier. We didn’t have a clue what he meant so decided to carry on anyway, hoping he wouldn’t come running after us. He didn’t, but we found the barrier and realised that the only way to continue was along a hiking trail in terrible condition. 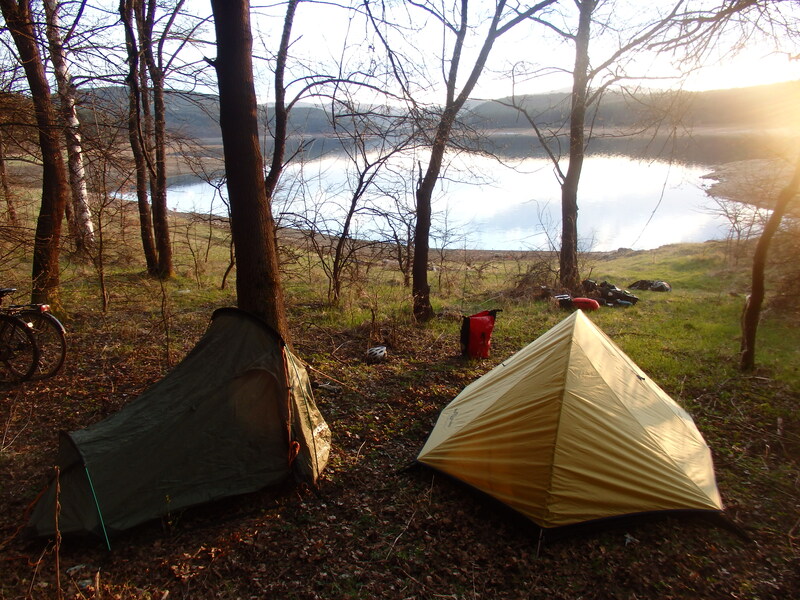 Knowing that the next day wouldn’t be much fun, we set up camp next to a beautiful lake without a soul around. In the morning we decided to push our bike around the lake to shortcut the woodland trail. Bad idea – after scrambling 3km around the edge we hit an un-passable cliff. 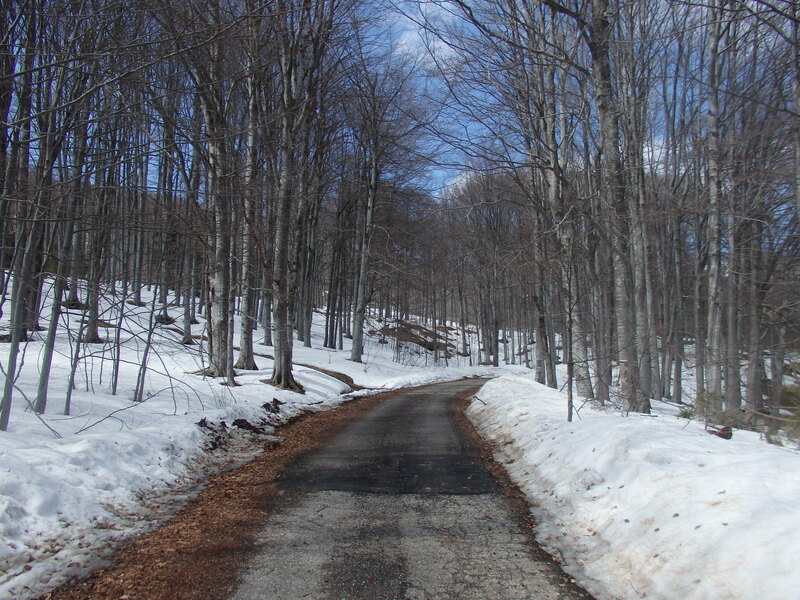 Nightmare, and so we had to push all the way back and take our chances on the hiking trail. The path was a disaster, steep climbs on rock tracks, unmarked field routes and completely flooded sections. 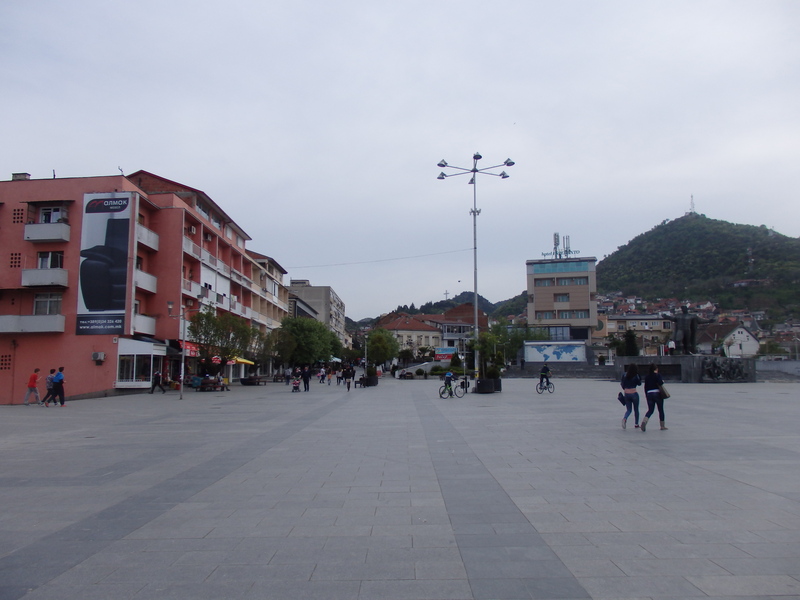 After a struggling morning we eventually reached the town Blagoevgrad, where we Couchsurfed with a couple. She was a translator and he was a priest in a local Orthodox church. 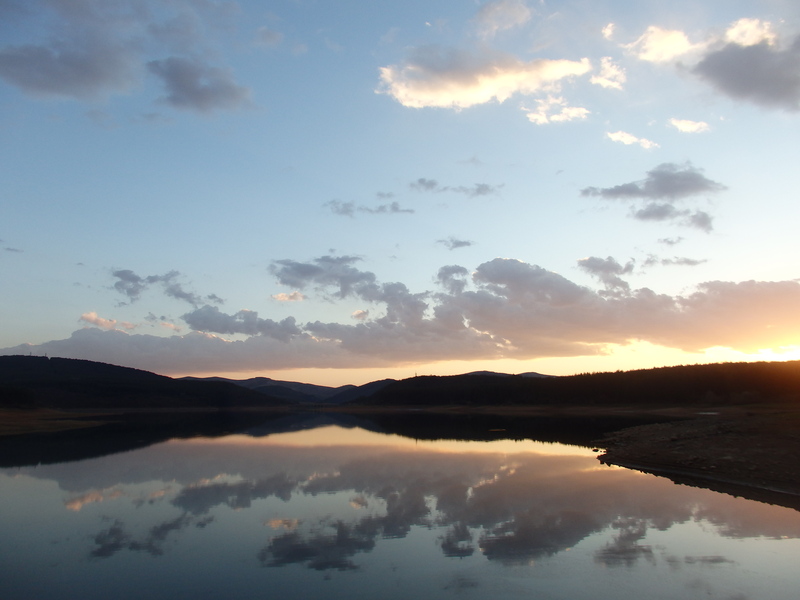 The next morning we headed west for our Macedonian detour. We had a big mountain to climb to find the border crossing at an altitude of 1,085m but shortly before then I had the opportunity to celebrate my 5,000km on the road! Macedonia had a different charm to Bulgaria. Everything felt a little more ‘sunny’ somehow – but it’s hard to say why. 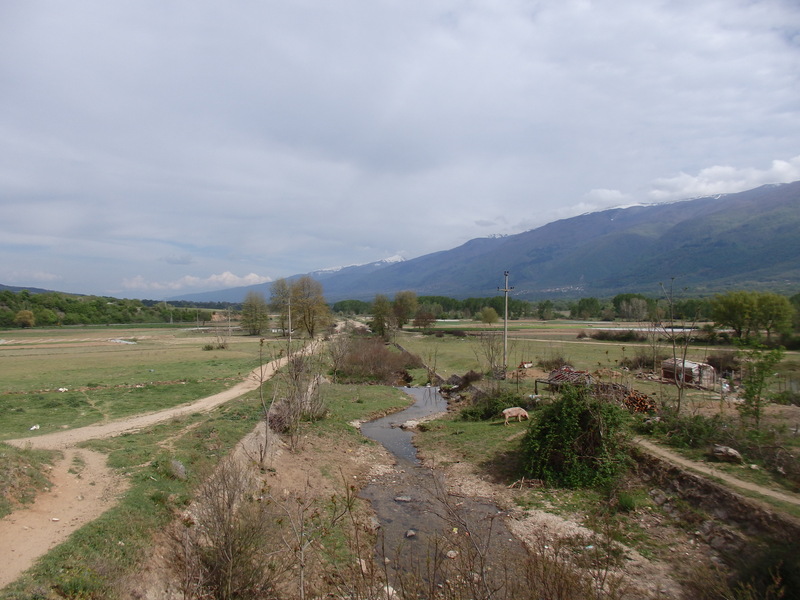 There was a little more money floating around clearly – the villages were a little less run down, but it still had that slightly shambolic Balkan charm. Everyone seemed to be in a good mood – waving us as we passed into the first valley and we made friends in the first place we stopped for a coffee. We were bought a drink (the local equivalent to ouzo) and invited to lunch by strangers. 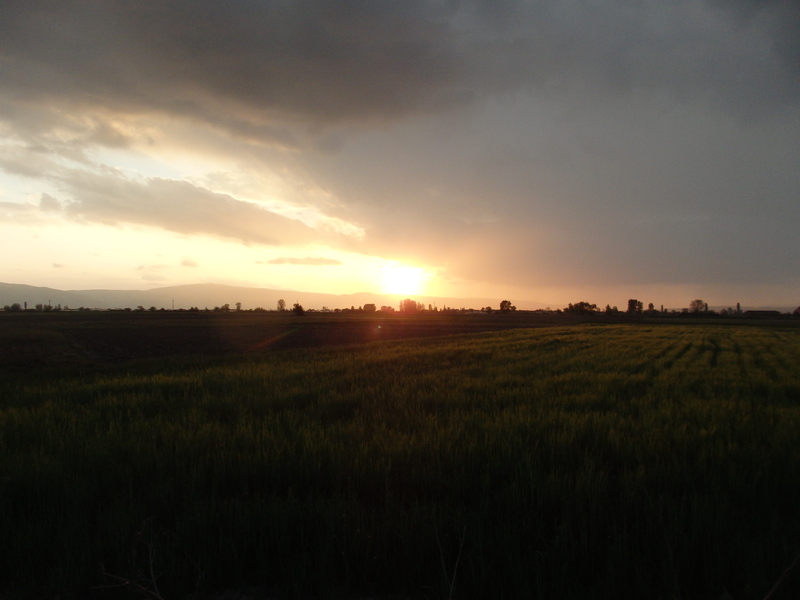 We continued south, and found a spot to pitch our tents by a maize field. To reach Strumitsa we had to conquer a couple of big mountain passes, the second of which was ‘Palazlija Pass’ at an altitude of 1,394m. My brakes had started playing up on the way (basically getting more and more pathetic) and had now reached a point where they weren’t working at all. The descent was a steep 1,000m and I simply couldn’t get down it. Tried to adjust the brakes but to no avail. We were reduced to hitching a lift. 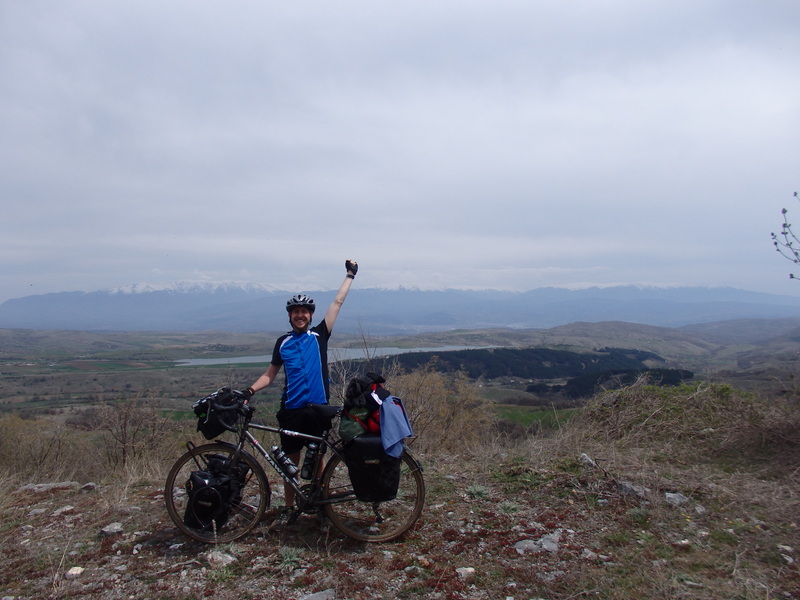 The nice Macedonians were happy to stop – the first guy clearly didn’t have space for a bike, but the second did and we loaded my bike in. I was about to hop in when Pia told me I could cycle hers down and meet at the bottom. It could be my ‘day 100’ present. She knew I hated the idea of not covering every meter by bike. Actually, I don’t think it would have bothered me in a situation like this one but I was thankful to enjoy the amazing downhill. 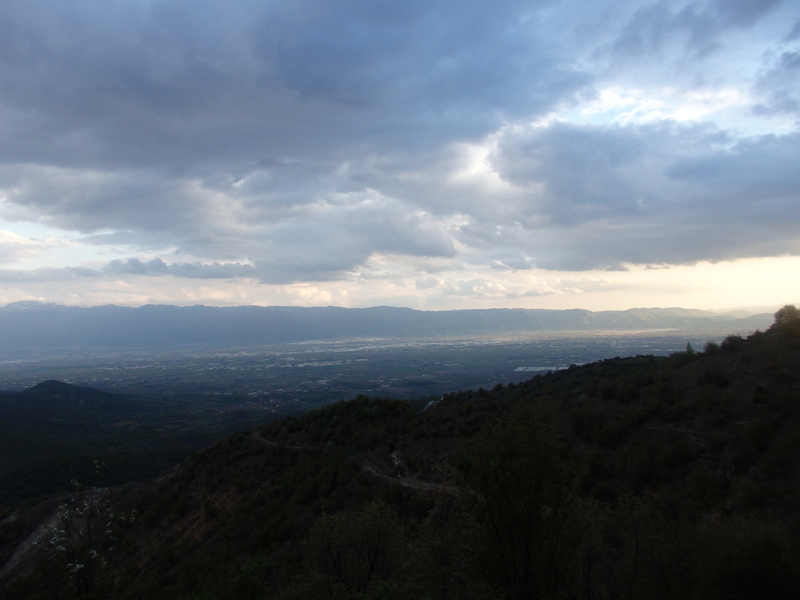 The view over the valley was amazing – the sun was low in the sky, to the west storm clouds were brewing but to the east blue sky was soaking half the mountains. 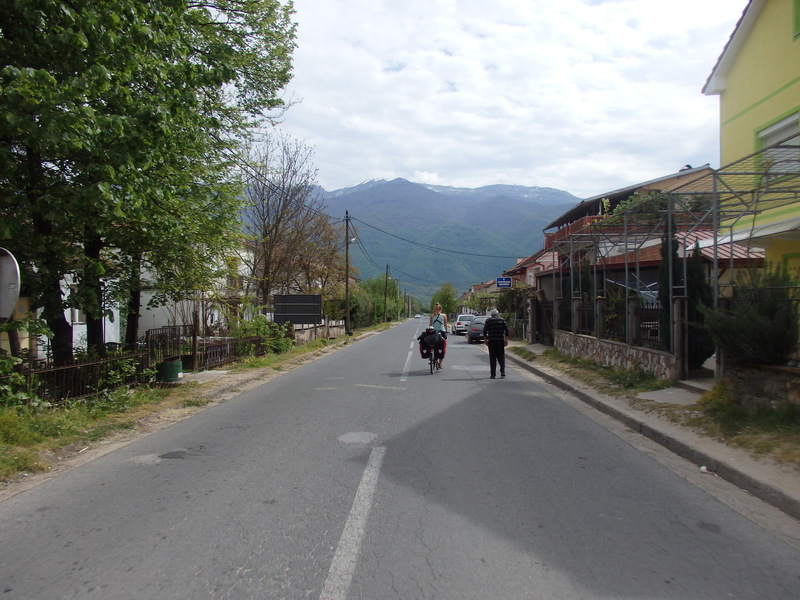 I could cycle the last (flat) 20km to Strumitsa and we found a hotel to stay in. This was the first hotel I’ve stayed in and it felt a little uncomfortable to be paying £20 between us for a room, but that probably just shows how cheap my routine has become. To celebrate my ‘day 100’ we went our for some drinks and decided to see if we had the energy to handle a local nightclub. 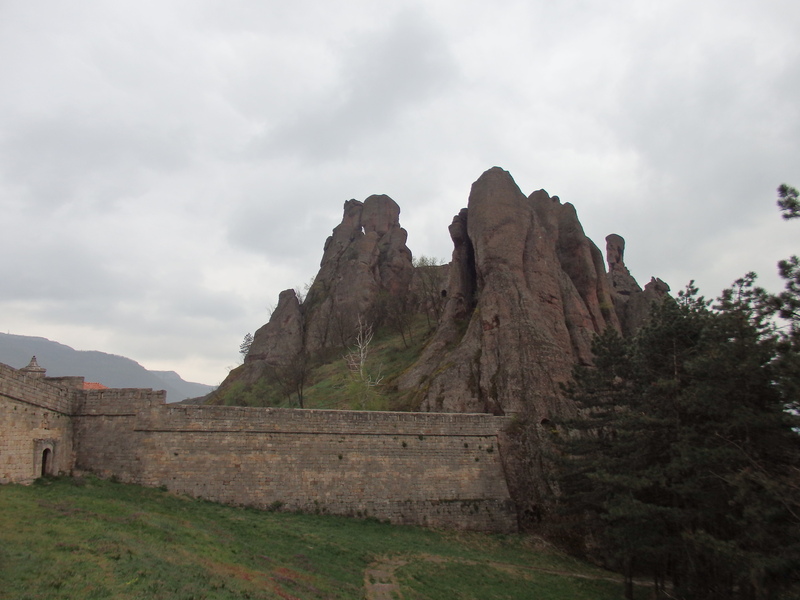 The place was strange – the Macedonians love dressing up over the top, but no one was dancing in the club. Everyone just stood around bar tables cluttering the dance floor head-nodding to awful EDM. The drinks were super cheap though, we made some friends and ended up staying til the lights came on at 4am. 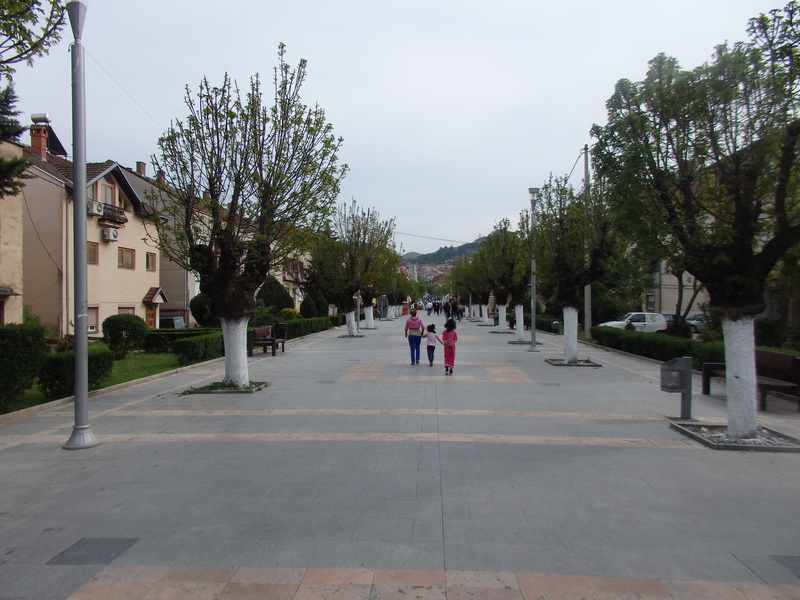 Had a nice day off doing nothing in Strumtisa – a pleasant but not particularly exciting town. It was Sunday and the bike shop was closed which was a pain. The following morning we went straight to the repair shop and luckily the guy adjusted my brakes for me. The pads are clearly worn (and he didn’t have any spares), but they’re working OK and hopefully can get me to Istanbul. 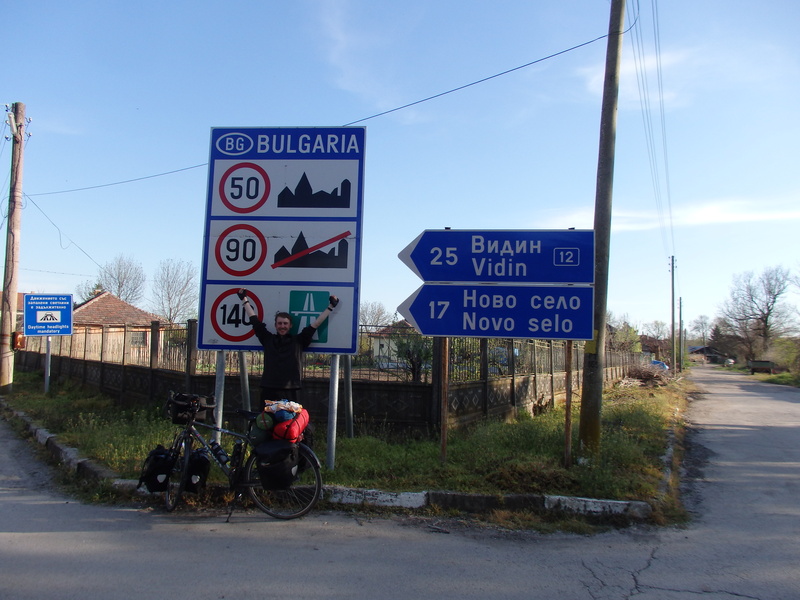 Happy to have a safe bike to ride again, we headed east and reached the Bulgarian border within 20km. 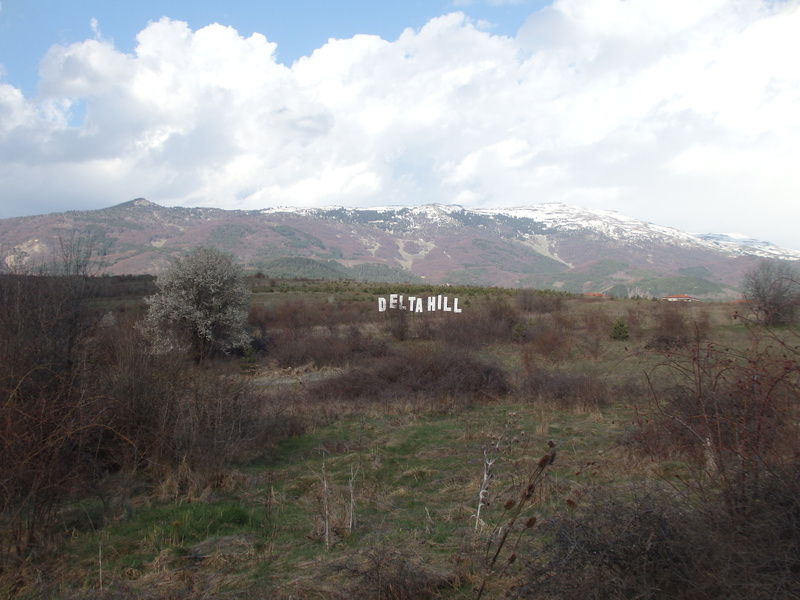 I was pleased to have made the detour into Macedonia – it made a really good impression on me in just a few days, but I was also excited to be returning to explore more of southern Bulgaria.